Mary McCandless is no stranger to the the recording studio and has several compact disc recordings to her credit. 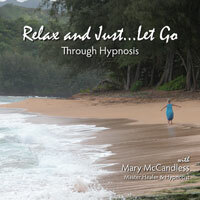 A Master Hypnotist, Mary McCandless, has produced this CD to help you create a peaceful sense of calm in every part of your life while enhancing your self-esteem through hypnosis. From day one, you will experience rapid, lasting, positive changes. Your mind will become calmer and clearer, you will feel healthier and happier, releasing stress and anxiety and becoming more confident in yourself. Hypnosis refers to a peaceful, meditative state in which positive suggestions are introduced into your subconscious mind. This can literally change your thoughts, feelings, perceptions and how you behave and react. Hypnosis is safe and effective and can increase your abilities to focus and help you move forward easily and effortlessly. Simply sit quietly and listen to one of these guided meditations at least once a day or even as you are preparing for sleep. Gently, positively, effectively, your life will change. Songs for Listening! Songs for Life! Songs for Listening! Songs for Life! was developed by the Learning to Listen Foundation and brought to life by Mary McCandless and Diane Leah. Each song takes on a whole new life teaching children how to listen and talk through the use of singing and music (especially those with hearing loss). Regardless of your age, this CD is contagious! You can't help but sing along.